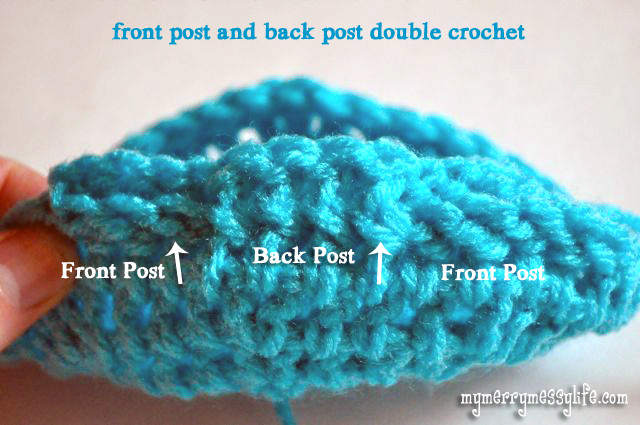 This is a crochet tutorial to learn how to crochet a front post and back post double crochet stitches. These stitches are especially helpful when you want to create more interesting patterns, like a cable or the basket weave stitch, as in the toy basket pattern I created. 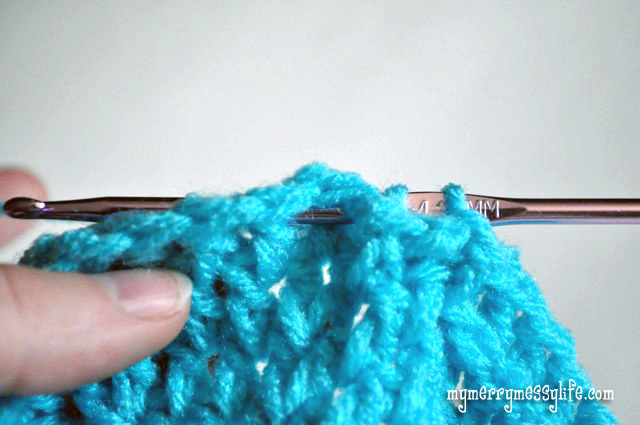 In the front post double crochet, you are inserting your work from the FRONT, like you’re stabbing the hook into your project. Hi yah! Work it! Now that you’ve got your inner karate kid out, yarn that bad yarn over your sword, oh, uh, hook. 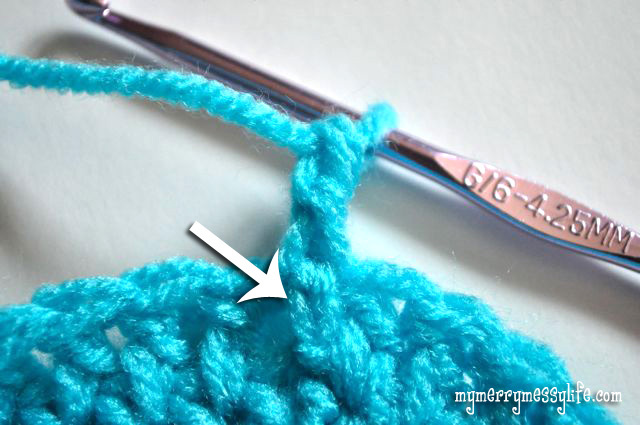 Then, insert your hook on the right side of the double crochet from the front to the back. Then, pull the hook through to the front, so it’s now wrapped around the back of the double crochet. 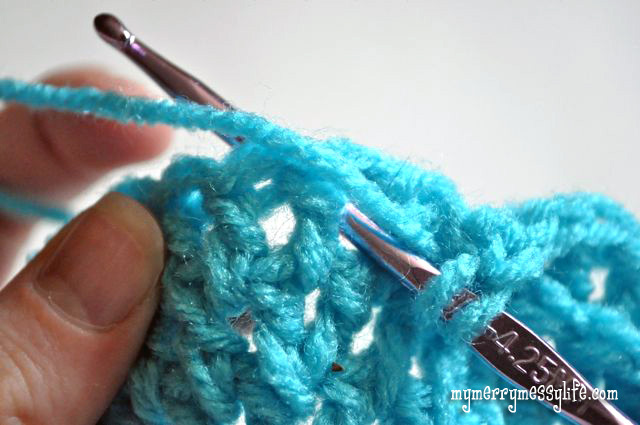 Now, yarn over again, and pull that loop underneath the double crochet post and pull up that loop. You should now have 3 loops on your hook. 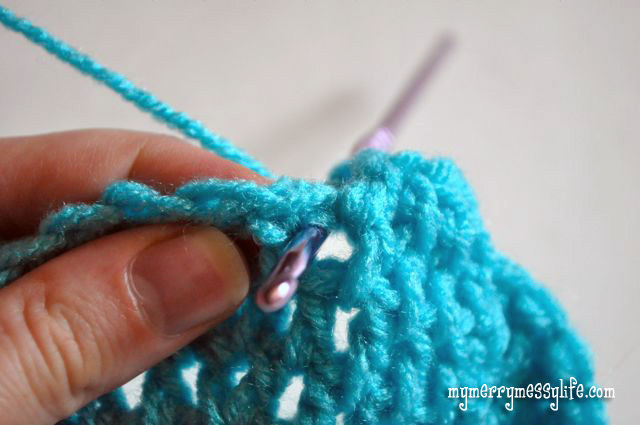 Yarn over again, and work a double crochet by pulling that loop through the first two loops on the hook. You now have 2 loops remaining on your hook. Yarn over and pull that loop through those last two loops. The completed front post double crochet! See how it sticks out in the front (where the arrow is pointing)? Same song, different verse. This time, instead of karate chopping your work with your sword hook, you’ll be stabbing yourself in the stomach! Oh, I mean, inserting your hook from the back of your work to the front of it. Yarn over. Twist your hook down and back and insert it from the back of the work and go over the front of the post. 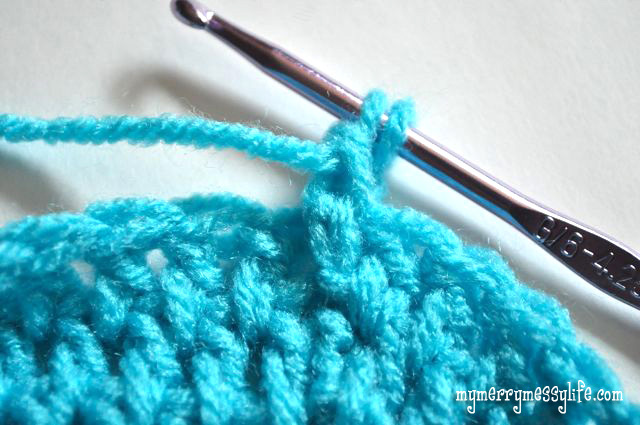 As the picture shows, the hook will continue going towards my thumb, over the double crochet post. This is what it looks like when it’s inserted from the back. 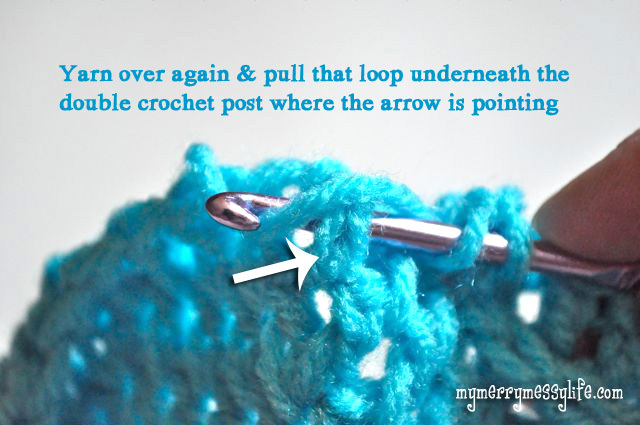 Then, yarn over and pull that loop over the double crochet post and pull up that loop. There are now 3 loops on your hook. Yarn over and pull that loop through the first two loops on the hook. There are now 2 loops remaining. Yarn over and pull that loop through the last two loops on the hook. Now have a few sips of wine, or a bite of your favorite chocolate because YOU DID IT! This is NOT easy at first, so be patient with yourself.